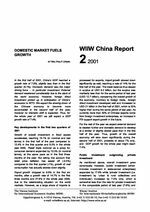 In the first half of 2001, China¿s GDP reached a growth rate of 7.9%, slightly less than in the first quarter (8.1%). Domestic demand was the major driving force - in particular investment. External demand weakened considerably due to the slack of the world economy. However, foreign direct investment picked up in anticipation of China¿s accession to WTO. We expect the slowing-down of the Chinese economy to become more accentuated in the second half of the year, however no dramatic shift is expected. Thus, for the whole year of 2001 we still expect a GDP growth rate of 7.4%.